Plot Summary: One day, second year high school student Kanade Amamiya is suddenly scouted by legendary idol Haruto Mikami. He now faces the life an idol with others in the same agency. 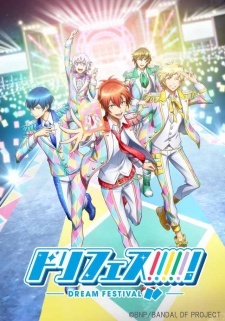 He aims to make his CD debut in Dream Festival!, joined by the mysterious Shin Oikawa, the stoic Junya Sasaki, the kind but passionate Itsuki Katagiri, and the clumsy but smart Chizuru Sawamura. In order to receive the Dream Festival! Cards sent by fans, can Kanade and the others become the best on stage?